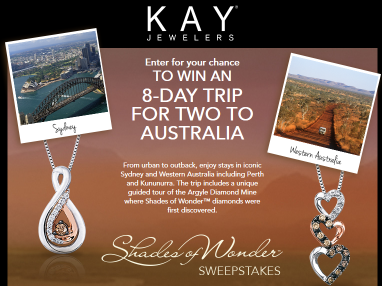 Kay Jewelers Shades of Wonder Sweepstakes – Win a trip to Australia! Win a trip for 2 to Australia (2 winners)! ENTER SWEEPSTAKES HERE – Kay Jewelers Sweepstakes page. ENTRY LIMIT – Limit one Registration entry per person/email address per day. ELIGIBILITY – The Sweepstakes is open to legal residents of the 50 United States and the District of Columbia who are 18 years of age or older as of date of entry. SWEEPSTAKES PERIOD – The Kay® Jewelers Shades of Wonder Sweepstakes starts at 10:00 a.m. Eastern Time (“ET”) on March 24, 2014 and ends at 4:00 p.m. ET on April 11, 2014. PRIZES – Grand Prizes (2): Two (2) Grand Prizes will be awarded from among all eligible Entries received. Each Grand Prize is an 8-day/7-night trip for (2) to Australia. Trip includes coach class air transportation between major airport nearest winner’s residence to Sydney, Australia and from Perth, Australia back to major airport nearest winner’s residence; all domestic flights in Australia; hotel accommodations based on availability and double occupancy in each city; round/trip ground transfers between all hotels and airports; a guided tour of the Argyle Diamond Mine; breakfast daily; and $1,500 spending money, awarded as a check for winner only. The approximate retail value (“ARV”) of each Grand Prize is $20,000. Weekly Prizes (75 total): Twenty-five prizes will be awarded each week, as follows: ten (10) from among all Registration entries received each week; ten (10) from among all Facebook® entries received each week; and five (5) from among all Twitter® entries received each week. Week 1 Prizes (25): A Shades of Wonder 1/6 Carat Total Weight Natural Brown and White Diamond Pendant in Sterling Silver and 10K Rose Gold (ARV $299 each). Week 2 Prizes (25): A Shades of Wonder Silver 1/4 Carat Total Weight Natural Champagne and Brown Diamond Pendant (ARV $399 each). Week 3 Prizes (25): A Shades of Wonder 1/4 Carat Total Weight Natural Brown, White and Champagne Diamonds set in a Sterling Silver and 10K Rose Gold Pendant (ARV $399 each). All prizes are Sponsor-specified. Availability of chain lengths vary by style.